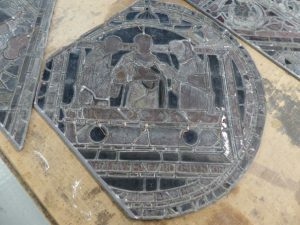 This week I’m going to concentrate on the ‘Medieval Faversham’ exhibition in the Faversham ‘Heritage Hub’, but I’m also going to mention briefly the arrival of Dr Rachel Koopmans from Toronto University, who, together with Leonie Seliger, have already started their joint pilot project on one of the Becket stained glass windows above Henry IV’s chantry chapel. More on this anon but first the exhibition. 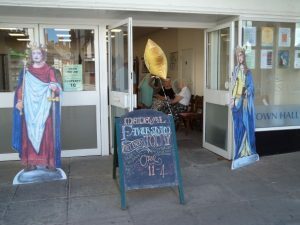 I know I have reported on the ‘Medieval Faversham’ exhibition on several occasions, but yesterday it was great to see people taking the time to read the various boards on the walls and the pop-up banners. Furthermore, the timeline similarly attracted attention as people worked their way down one long side of the room. 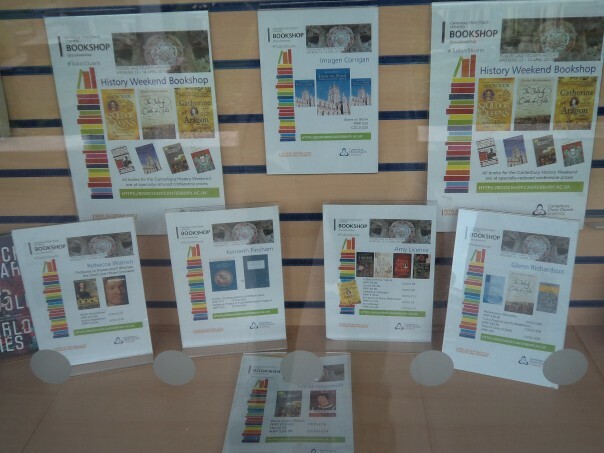 Fortunately, we were able to get all the exhibition boards and pop-up banners done before the exhibition opened on Saturday 7th July, but we are still waiting for images from the British Library covering a long, narrow map of Faversham town and creek from the time of Henry VIII. This map is thought to have been made as part of the coastal defensive strategy against the French in the 16th century and the detail is excellent. We have used a small section already as part of the timeline showing Faversham’s crane, but we think people will be interested in a much longer piece that shows, amongst other features, the great tidal watermill. Such a watermill is recorded in Domesday as being at Dover, the mill said to be ‘at the entrance to the harbour… which wrecks almost all ships, through its great disturbance of the sea’, presumably not an issue at Faversham. However, what has been on display these last two Saturdays and will be again on the 21st July are two of the magnificent town charters, ‘borrowed’ from the country archives at Maidstone, and the Faversham book containing the custumal from the late 14th century– only slightly later than the time of the Peasants’ Revolt, with its original leather cover and metal clasps. In order to ensure people can have a good look at these, the town’s 1300 copy of Magna Carta has its own secure display case with controlled environment to ensure its safety and wellbeing, while the great charter of Henry VIII to the town in which the king restated the rights and privileges granted by the Crown, and the custumal book are in a large secure display case near to the exhibition board explaining what a custumal is and the types of information recorded therein. 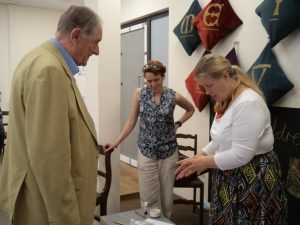 Moreover, there is a pop-up banner on the Henry VIII charter to give people some relevant information concerning what it is, and why these documents are important, not only to Faversham but in a broader context too. 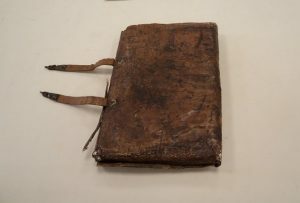 Regarding the book with the custumal, of special interest is the fact that it also contains a town chronicle and extracts from the prophesises of the mystic John of Bridlington. Again, there are pop-up banners with more information about both the chronicle and the prophesises, as well as ‘talking tiles’ which were very popular yesterday, especially among young visitors. These tiles, including a reading of the opening lines of the Magna Carta, give a flavour of these documents. 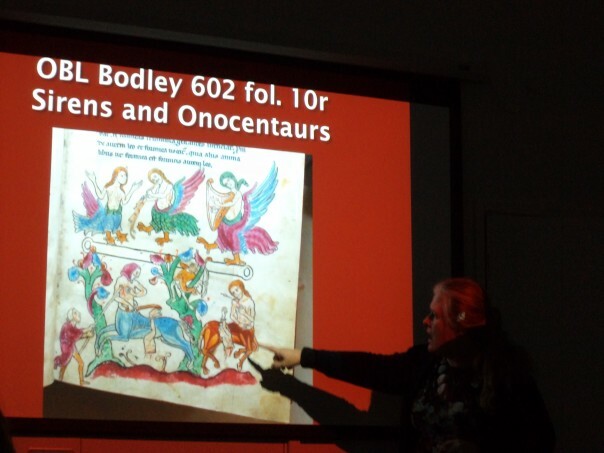 This is wholly appropriate because charters were designed to be read to their audience, for example, ‘John by the grace of God King of England, Lord of Ireland, Duke of Normandy and Aquitaine & Earl of Angou, To all Archbishops, Bishops, Abbots, Earls, Barons, Judges, Sheriffs Provosts Ministers and to all Bailiffs and other his Liege people sends greeting. Know ye that we have given, and by this our present Charter do confirm unto our well beloved …. The exhibition panels and pop-up posters are here, but not the timeline. For the documents, there are images as part of the exhibition and this image shows part of the archaeological display in the other large secure case, much of it from Dr Brian Philp’s excavation of the Faversham Abbey site, which is in the safekeeping of Dr Pat Reid the leader of Faverham Society Archaeological Research Group. 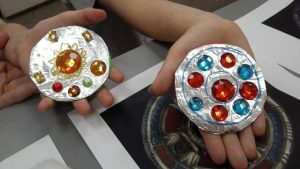 For younger visitors to ‘Medieval Faversham’, who preferred a more hands-on approach beyond pressing the ‘talking tiles’, Diane and Pip were on hand to offer three types of activity: making an etched tile, designing an Anglo-Saxon brooch, and creating a ‘pearl’ of wisdom. 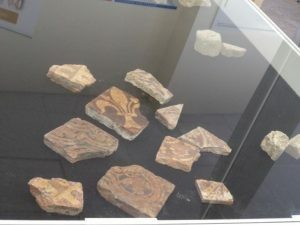 All three activities provided strong links to the town – the tile design was based on tiles found in the Faversham Abbey excavation, visible close by in the display cabinet; Diane had provided colour images of Anglo-Saxon brooches found at Faversham – in the King’s Field, now in the Ashmolean at Oxford, albeit there is one brooch from the King’s Field now on display in The Beaney at Canterbury (previously in the Canterbury Heritage Museum); while the ‘pearls’ of wisdom used oyster shells, an industry that was extremely important to the town during the Middle Ages (as well as in the centuries before and after medieval times). 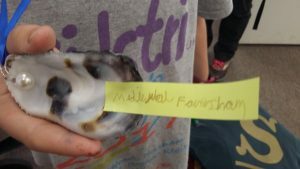 These activities proved to be extremely popular, in fact one family who had made several brooches in the morning were back to make pearls of wisdom in the afternoon, and another family had been busy in the ‘Young Medievalists’ Corner’ on both Saturdays. 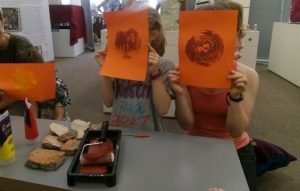 For as well as the activities, the chance to sit on one of the special cushions was also a considerable draw. Finally, I want to leave Faversham and bring you back to Canterbury because this week I was also fortunate to meet up with Dr Rachel Koopmans, who had just arrived from Canada to undertake her Visiting British Academy Award project in conjunction with the stained glass studio at Canterbury Cathedral. 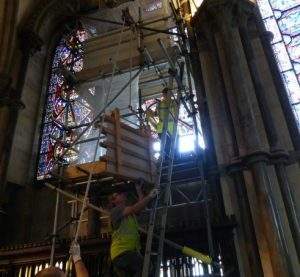 This pilot project, also sponsored by the Friends of Canterbury Cathedral, will involve a forensic investigation of the early stained glass in nV, one of the truncated windows above Henry IV’s chantry chapel. The collaboration between Rachel, who is the expert historian, and Leonie Seliger, the stained glass specialist, is a fantastic opportunity to look in as many ways as possible at the glass to ascertain, amongst other things what is medieval glass, what later; whether it ‘belongs’ in this window, what may have been there instead; what was the compositional scheme of the window; the implications on this on dating, on the overall scheme of ‘Becket’s miracle windows’, on the thought processes of those commissioning the windows, ideas about style and glazing, and lots, lots more. So, I want to report that the glass from this window has been safely removed and is sitting comfortably in the cathedral glass studio, and even more significantly is already beginning to give up its secrets. Furthermore, alongside studying the glass itself, Rachel will be making further use of the records held in the cathedral archives, as well as records elsewhere, to investigate more deeply what she can discover about post-medieval movements of the glass from this window around the cathedral and beyond. In addition, she is working on the early miracle stories, as recorded by William and Benedict and several other related strands. Consequently, it is difficult to over emphasise the importance of this study and I’ll keep you posted as things progress.